Meanwhile at the fishing village of Qantab, just along the coast from Muscat old town, a shipyard was prepared and an international and Omani team of archaeologists, carpenters and ropeworkers was recruited to take on the difficult task of building Jewel of Muscat. The team knew they faced a considerable challenge, for though the Belitung wreck provided vital new information, more than half the ship’s structure remained something of a mystery. Tests on the wreck’s timbers had revealed, however that the ship was built mainly from Afzelia Africana, an extremely dense hardwood with a very particular grain pattern suited to sewn boatbuilding. 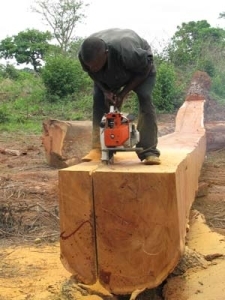 1,000 years ago such wood was available in east Africa, and perhaps even Oman, but in the summer of 2008 Dr Vosmer had to travel to Ghana in West Africa to find the right trees. On October 7th 2008, after a long and difficult journey, the timber finally arrived at Qantab and construction began. The first step was to set and lay the keel of the ship, which was completed within two weeks. The team then moved on to what was to prove one of the most challenging stages of construction – sewing the first planks or strakes to the keel. For sewn ships to be seaworthy, it is essential that the planks fit perfectly. The team faced considerable difficulties in trying to discover how the ancient shipbuilders were able to twist and bend the planks of iron-like Afzelia Africana into shape. They experimented with soaking the planks in the sea and heating them without success. Only when they tried steaming them, did they manage to make the planks pliable to sew one onto the other with a perfect fit. By mid December sewing the first strake was complete and gradually the construction of the ship gathered pace. The process of sewing each strake was a skilled task. If the stitching was too tight there was a risk the rope might snap. If the stitching was too loose the ship would leak. Throughout January 2009 Jewel began to take shape as her hull rose up from the keel. 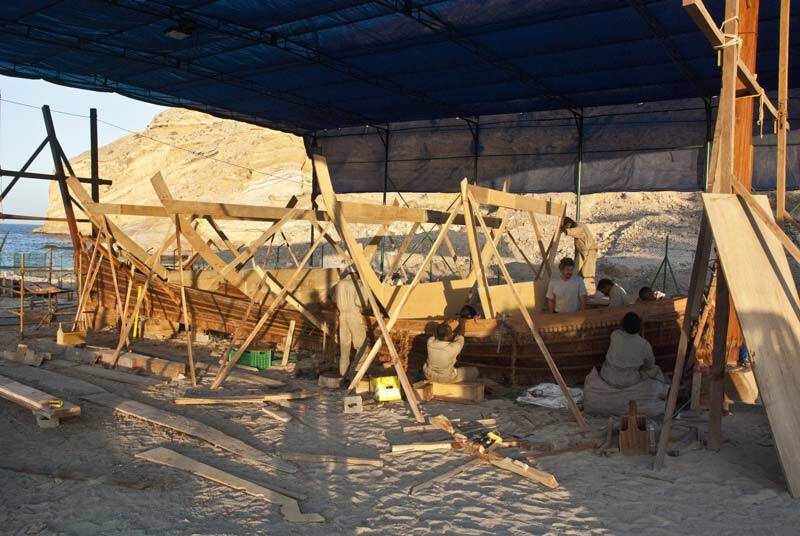 In February the first frame timbers, many of them made from Omani Sidr (Ziziphus Spinachristi) wood, were fitted to reinforce her hull. March the team at the Qantab shipyard were honoured to receive a visit from the President of Singapore H.E. S.R. Nathan. The President toured the shipyard showing great interest in the ship, and the techniques used to build her, before formally launching the project website. Later that month the project faced a challenging coastal squall which wrecked the shipyard, bringing the protective canopy crashing down on the ship. But Jewel survived her first storm unscathed and within days the damage had been cleared and work was once again underway. For the next three months the construction team, using traditional hand tools and methods wherever possible, worked on with skill and patience. As Jewel began to take shape, her natural beauty became ever more apparent. Every stage of construction brought new challenges and provided vital new discoveries as they were overcome. What Dr Vosmer and his team of archaeologists had always believed was proving correct; the only sure way to discover how such sewn boats were built was to actually build one. By April the huge keelson timber weighing nearly a tonne had been fitted and lowered into place. By late May three-quarters of the hull’s planking had been sewn. Through the intense heat and humidity of the Omani summer work continued. In August the huge through-beams made of Indian teak were fitted to brace the hull, and then in September the 21st and final row of planks was sewn to bring the hull to its full height.